The idea that children are meant to break mother’s hearts was once an insane idea to me. How in the world did I, in all my perfection, with a mother who adored me, possibly have the capability of breaking a mother’s heart? Shouldn’t the only thing a mother have is regard, true love and devotion, and maybe a dose of humor when speaking, thinking or even seeing their child? Then I got a child. And I realized even as they take their first breath, a breath totally without my support, a journey begins that life simply can not prepare you for. There is no way to understand the kind of fear that a mother feels. There is no way to understand the literal breath stealing that a child is capable of. There is no way to describe that single knowledge, that without my child’s life, I shall not live. My life is so easily expendable that I can literally accept my death for my child, and each and every moment of my day is spent praying that God just forgets about me, and simply and completely focus his eagle eye on my child. But at the end of the day, our children do break out hearts, just as they are supposed to. They are supposed to enter this world with their own breath, their own dreams, their own revelations and take those wings and fly further than we do. They are supposed to create a stage of their own making, and they are supposed to break the very foundations we have created. It is the purpose of childhood and ultimately the purpose of the mother. Without that break, we wouldn’t have Mr. Lincoln, or Mr. Washington. We would never have seen Mr. Pitt or Mr. Day-Lewis. We would never have dreamt of walking on the moon in the footsteps of Mr. Armstrong, and we would never have sung with the sweet harmony of Mr. Sinatra. 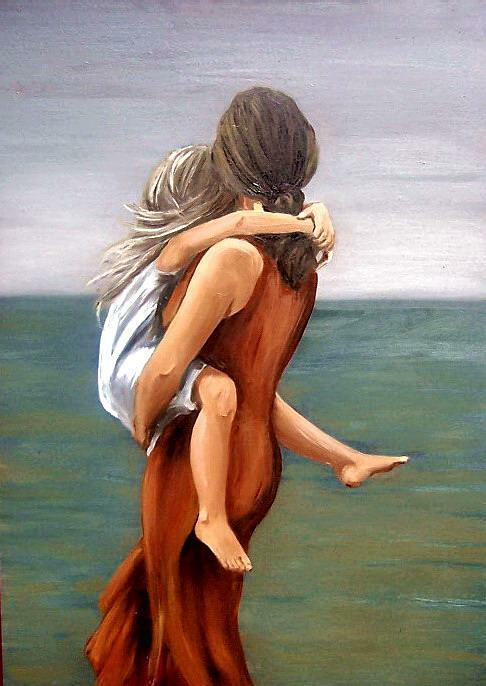 Without childhood, without the dents, cracks and faults in a mother’s heart we would never have been anything at all. And a child can break our heart; when we realize that they do not need us, that they can fly all on their own. When they realize that love is not simple and can be beautiful in arms far away from the ones they were born in. A mother’s heart can be broken easily after each scar, each scrape that mars the perfection of her baby, and yet we also know the price, the broken heart, is what we must endure for the sake of the very child we let fly. Children are meant to break our hearts is not what I once believed, an image of pain, of suffering. Rather it is a right of passage that we, as mothers, must endure. I have to let my child scrape their knee, and have their soul crushed. I have to allow them pain, as much as dirt, and I have to allow them all this with the full knowledge that they might never understand that beauty, kindness, even goodness is so much more important. I have to presume as a mother that with my broken heart comes a lesson for my children that will make them better. I have to presume that while they can fill my heart with breath stealing moments of perfection, that perfection must come occasionally as tough lessons. I can’t hold onto them, shelter them, and keep them as the loving, cooing, adorable babies that they once were. I can’t stop them from realizing that while a mother’s love is all-encompassing, it isn’t the only love to be had. And I can’t stop them from flying; and it breaks my heart that in many cases, I can’t even provide the net. To my baby girl, happy birthday. For every moment my heart breaks, my hearts soars not only in love, but in absolute pride. May God continue to hold you in His arms, and allow you to find your own net. In the meantime, borrow mine, it looks better on you anyways. I don’t mind at all. Thank you for your beautiful words. OMG this was so well written and so beautiful! You were right on the money with this. And just so you know, I am dreading the day … the day when they leave. Because since they were born they were very existence. The reason for everything… but they must leave. Uh…. you sang the song in my heart! Thank you for your comment especially about my writing. As for my daughter, she is three but even this early she loves the attention, so I will let her know.